Every young lady dreams of the day she will turn 15 and be the star of her own Quinceanera party. Her gown is one of the highlights of her young life. She will spend time dreaming of it and selecting it from among hundreds of choices. This figurine depicts the sweetness of a young lady showing offer her unique gown. The beautiful pink dress is accented with silver scroll designs. In her hands is a pink butterfly ready to take flight. 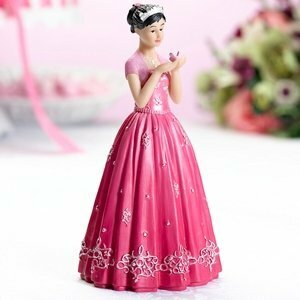 At 6" tall and 3.375" wide, the figurine is perfect as a cake topper, or, it can grace the tables as a centerpiece. It can also be given as a favor for girls to take home.